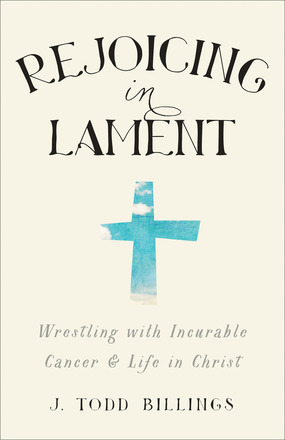 J. Todd Billings, Rejoicing in Lament: Wrestling with Incurable Cancer & Life in Christ. Brazos Press, 2015. It is a rare book that can hover between the academic and the personal in a way that enriches both realms. After he was diagnosed with multiple myeloma at age 39, J. Todd Billings’ life took a surprising turn. A future that had once been measured in decades now lay shrouded in fog. This narrowing of his future led Billings deeper into prayer as he wrestled with his diagnosis. The fruit of that reflection and his journey is found in Rejoicing in Lament. As Billings notes, “God’s story does not annihilate my cancer story, but it does envelop and redefine it. Indeed, it asks for my story to be folded into the dying and rising of Christ as one who belongs to him” (169). The shape and tone of Rejoicing in Lament follows this central claim. It is a book about a man’s journey from his diagnosis with multiple myeloma through treatment and eventual bone marrow transplant. It is this story, but it is much bigger than this story. Rejoicing in Lament is a book about cancer, but it is about much more than cancer. It is neither a memoir nor a theological treatise on the problem of evil. Instead, the questions he wrestles with and the suffering he undergoes become vivid windows into the depths of the Christian life and the profoundly good news of the Gospel. By sharing his life, Billings does not point back to himself, but allows his story to point to God’s promises, to God’s faithfulness, and to the call to prayer and discipleship. The opening chapters explore Billings’ initial experiences of diagnosis and treatment and the questions they raised. His anguished question ‘why?’ is left unanswered, but instead, it is brought before the Lord in prayer. Drawing deeply upon the psalms of lament, Billings finds a space to offer grief, confusion, frustration, and sorrow to God from a place of trust. Lament, for Billings, is not a sign of disbelief or lack of faith, but can only be truly made from a place of trust in God’s promises. This exploration leads him into discussions of mortality, and of the nature of creaturely knowledge, as well as theological concepts such as concursus and divine impassibility. His explanations and use of these concepts manages to be accessible without losing clarity and substance. The second half of the book draws more explicit connections between Todd’s journey with cancer and the nature of the Christian life. Even in the dark, even in the dim fog, God’s unfailing love can be trusted. And so we rejoice and we lament. This book is truly a feast. One of the most profound blessings of Rejoicing in Lament is Billings’ refusal to settle for easy answers. He argues that the ‘problem of evil’ should remain an open question. An open question gives us freedom to lament and freedom to trust in God. Easy answers often serve as excuses to blame others or refuse to act ourselves. If my friend is not healed because of his lack of faith, then I don’t need to do anything about it. If his suffering is directly a result of God’s perfect plan for him, then why should I work to alleviate it, since it’s God’s will? Instead, Billings calls us to ‘join the resistance.’ Lamenting includes not only prayers of protest before God, but actions of protest. The world is not as it should be. Christ has not yet returned and set the world right. Therefore, our response of compassion takes on the nature of protest. Rejoicing in Lament is a book for theologians and pastors. It is a book for those struggling with cancer and for those who care for them. It is a book for regular people who pray and who struggle to walk with God. But even more so, Rejoicing in Lament is a book for all those who belong to Christ and groan for his return. It is a book for all of us and it is well worth reading.